End-user account emails, including the welcome email and email verification email, notify agents and end-users about changes to their profiles. These system-generated emails are among the earliest communications you'll have with a customer, and you can customize them to better match your brand or organization's guidelines. For more information on system-generated emails, see Managing your automated emails. End-user clicks on "Forgot my password" and enters their email. End-user goes through the "Sign up" form to create a profile. Agent creates the user and "Also send a verification email when a new user is created by an agent or administrator" is enabled. Agent clicks "send verification email again" on an end-user profile. End-user submits request = End-user likely receives a notification email via trigger - if they click the ticket link since they haven't set up a password yet they're not logged in > they redirect to Zendesk > they have to sign-in and then they enter the email to get a verification link to set a password. This email sent in this case is the same as what happens when you are an end-user and go through the "forgot my password" steps. Both will send the end-user a welcome email, not the verification email. This email is sent from the default support address of the brand where the user signed up. If a user is created by an agent, the email is sent from the default support address of your default brand. Click the Admin icon ( ), then select Settings > Customers to open the End-users settings page. Scroll to the Account emails section. In the User welcome email text entry box, update the text as needed. (Optional) Select Also send a welcome email when a new user is created by an agent or administrator to send an email when a new user is created on behalf on an end-user; deselect this option to send a welcome email only when the end-user creates their own new user. Click Save tab at the bottom of the page. If you have multiple brands, you also have the option to include a list of active Help Centers in the welcome email. Click Include a list of active Help Centers in account emails checkbox to enable this feature. End-user adds an additional identity to their account. The agent manually sends the verification email to the new identity. The email is sent from the default support address of the brand where the user signed up. 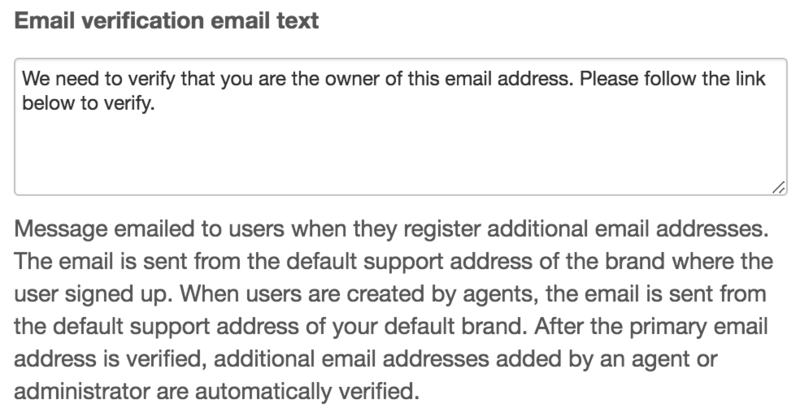 When users are created by agents, the email is sent from the default support address of your default brand. After the primary email address is verified, additional email addresses added by an agent or administrator are automatically verified. In the Email verification text entry box, update the text as needed. 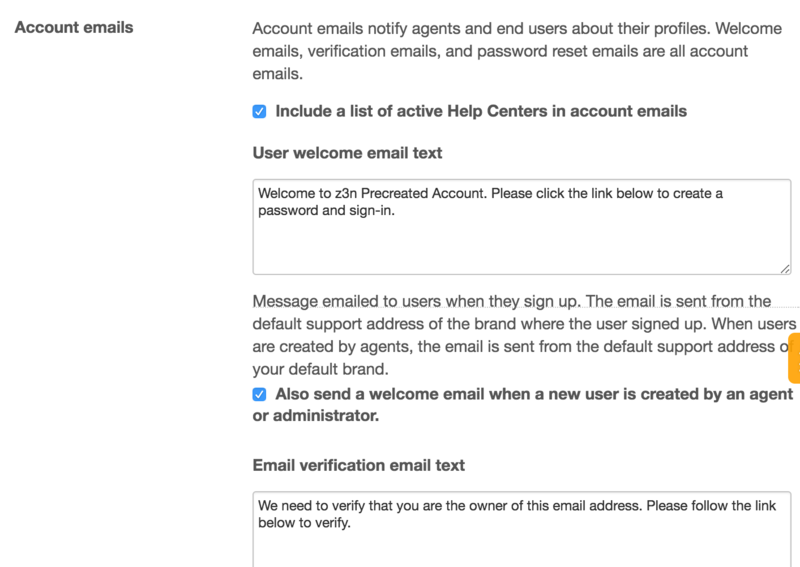 If you have multiple brands, you also have the option to include a list of active Help Centers in the verification email. Click Include a list of active Help Centers in account emails checkbox to enable this feature. Is there any way to update the 'password reset' account email text? Specifically to update the URL within (I need it to point to our own domain, not the 'zendesk.com' domain). I'm afraid it's not possible to edit the content of that email. Are you using SSO? If that's the case, there's another option. Go to the admin settings in your agent interface, scroll down to Settings, click on Customers, and then scroll down to Allow users to change their password. If you're using SSO, you'll want to uncheck that box so your users don't have the option to reset their own passwords. Do you think that'll help? Thanks for the reply. We are currently not using SSO, and we cannot update the 'host mapping' field within ZenDesk, as we host our KB at our own domain (i.e. we do not use the Help Centre directly). It seems that the only resolution would be to set up and switch to SAML/LDAP or the like, and host/reset the password elsewhere. Also, how can I get the email text to appear Left-to-Right? The HTML formatting I'm trying (without DC) isn't working. Some users receive the email in LTR languages, and I want it to appear properly. You should be able to use both HTML and Dynamic content in your emails. I found a very helpful article titled Customizing templates for your email notifications that can help you implement and customize emails using both. Feel free to check it out and let us know if you still have questions. I have multibrand, and it's less than ideal (makes my company look unsophisticated) to have a generic welcome message shared across all brands. Having the from address on the email as well as the subject to reflect the brand is not enough, as my brands are quite different. I would ask that having the ability to have a custom welcome email per brand be prioritized higher. Also, I think it would more likely to want to include the help center for the one particular brand, instead of for all active brands.That's what I would want. Finally, when listing out the help centers, it would make sense to use the host mapping url (i.e. http://support.company.com) if we have gone through the effort of setting this up, and are actively marketing that url. Hi Nicholas! Thanks for sharing that feedback! I checked in our Product Feedback topic and didn't find anything that matched up with what you're suggesting here. If you're up for it, it would be great if you'd cross post this over there to ensure that our Product Managers see it! You can customize the HTML template to match your branding by making a few simple style changes. I found a very helpful article titled Customizing templates for your email notifications that can help you implement and customize email layout. I am unable to apply my customised welcome email template which is received by users after they registered through Help Centre. It still shows the default Zendesk email template. Is there a bug? Hope to hear from someone and thanks in advance. Can I disable the welcome email for new end users?